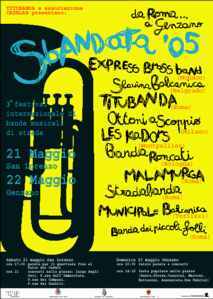 The third Sbandata, an insane convergence of street bands, mostly brass bands, from italy and europe. This year it was in Rome. It was madness. I was only there saturday and sunday, which is probably good, ’cause I don’t know if I would have survived three days. Either I would have lost my hearing or floated off into the stratosphere supported by an angelic chorus of baritone horns. Imagine if Kustritza was asked to throw a civic event ….. If I understand right, “sbandata” means something like “to drift” or “to swerve” as in “the drunken musicians swerved into the street, colliding with pedestrians and tangling traffic with continuous high-decibal acoustic music and general joyus mayhem”. Or something like “he falls in love but lost the mind and is wandering in the street.” Very apt description. I don’t really know much about who did the organizing, I think the coordination was done by folks from the Roman band Titubanda (probably the best street band in Italy), with some financial support from the city of Rome. I think the city gave us the food and wine anyway, as well as somehow supporting/permiting the squated/ceeded ex-elementary school where we slept (those of us who did) on the floor. Everything seemd to appear magically out of delightful anarchy.